Roydon Clark was born April 4, 1928, in Dalton, PA, to a family of eight who became crop tenders, migrant farm workers, all over the country. Then in 1942 young Roydon spent his summers around the famous Hudkins stables, right across the street from Warner Bros. Hudkins provided livestock and wagons for western films and when Roy’s family separated, he was taken in by the Hudkins family. Roy started making 25 bucks a week pitching hay, taking care of horses and doing general chores around a stable. Roy also doubled for Errol Flynn (in “Montana”) worked with John Wayne on seven occasions (including “Fighting Kentuckian”, “Undefeated”, “The Conqueror”, “She Wore a Yellow Ribbon” and “The Shootist”) and Clark Gable (twice). 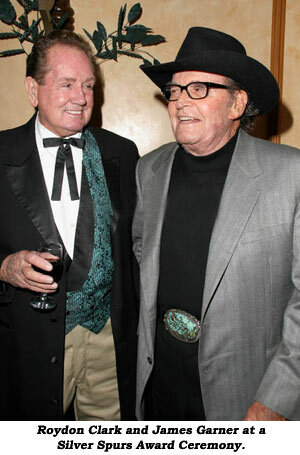 When James Garner was signed for his classic “Maverick” WB TV series, Roy was there and doubled Garner for over 40 years in titles like “Duel at Diablo”, “Hour of the Gun”, “Support Your Local Sheriff”, “Sunset” and of course Garner’s other TV western series, “Nichols” and “Bret Maverick”. 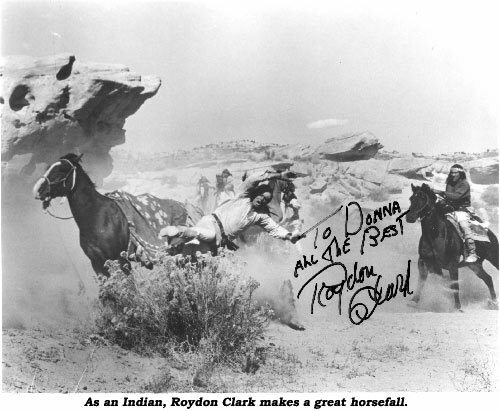 Other western films for Clark were “Colt .45”, “Badlands of Montana”, “A Distant Trumpet”, “Bandolero”, “Little Big Man” and TV episodes of “Cheyenne”, “Sugar-foot”, “Bronco” (“I was at Warners for 17 years,” Roy proudly announces, “movies and TV.”), “Bat Masterson”, “Lone Ranger” and “Bonanza”. Roydon also worked on such big films as “Towering Inferno”, “Bonnie and Clyde”, “Indiana Jones and the Last Crusade” (the motorcycle stuff for Sean Connery) and the Naked Gun films. Also, for four years, he, stuntman Reg Parton and another stuntman were stunt safety investigators (volunteer work) for the DGA (Directors Guild of America) following up on accidents to try and prevent future problems. 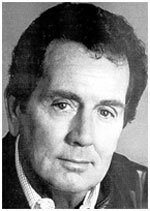 Roy eventually broke into the stunt co-ordinator ranks handling all the action on James Garner’s “Rockford Files” and many other series including “Whiz Kids” and “Amazing Stories” for Steven Spielberg.